Plenty of people leave home when they go to college and never return. “My home” is different in many ways. I live near by the city where I grew up, but “my home” was with my ex-wife and daughter, who now live 7 miles away. “Home” for me is a touchstone of sorts. What do you think, what feelings are conjured up when you think of ‘home?” Someone asked me this very question, so I gave it some thought. I pondered it, I wrestled with it, I even tried to deny it. When we are children our homes are so important to us. 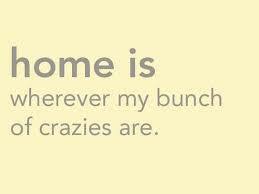 Whether its a good home or a crazy home, as children we find comfort and constancy in our homes. Do you ever reminisce of the home where you grew up? I have tried very hard to erase all the memories of my childhood home. It was a house of horrors no fond memories for me. Since my childhood home is a wreck of a thought, “home” to me has come to mean something more about people and less about a place. I know people whose parents still live in their childhood house. Some of them still have their original bedrooms. Nothing like that exists for me in this world. Don’t feel bad, its a good thing at the very least. On top of my childhood house of horrors, I left home at 13 to go to boarding school. Once again I planted no roots and barely unpacked my suitcases during those 4 years. After college I went straight to Wall Street and got lucky as a principal trader for Sachs. By the time I was twenty two I bought my first house. It was on Cape Cod on the ocean; a dream come true. It was very important for me to buy my own place. I have already created my own Universe, and wanted to create a house and morph it into my “home.” A place filled with happiness, and no worries, lots of food and great drink; most importantly to me the friends that create my life. I am a well travelled traveler. I live to be on the go. I find myself most comfortable in strange, unfamiliar places. Living out of suitcases but with my close friends. My friends and my family that I have created, are essentially my ‘home’, no matter where I rest my head at night. Everything got different real quickly when our daughter arrived. Children need a real “home”; a constant structure to thrive. We moved to New England where I grew up. It offered our daughter the best opportunities that we so badly wanted. This is my home wherever I might be……..
We planted our roots in the house that became my daughter’s childhood “home.” We owned multiple houses, our main one was called Gypsie House. I think I traveled with my daughter almost 1/2 time. We would travel and visit relatives and always lived out of our suitcases no matter where we stayed. The wanderlust has continued with my daughter. Yes the physical house means something to her. However her passport is already filled, this Spring was Prague, Vienna, and Budapest. My daughter loves being out in the big word, living out of suitcases, then is happy to return home. Home for my daughter did not change one bit when we sadly divorced. I refused to take out anything from her “home”. Lots of the furnishings were my family’s heirlooms. I left with a knapsack on the day we separated, and lived in suites of hotels for 16 straight weeks. I am a person who could truly live in a suite in a hotel. No nothing in the suite is mine but my clothes and electronics-it so works for me. So when I got asked about “home” the explanation I gave was greeted with a perma-smile and uncomfortable pause. Home, it’s something unique to us all. I feel most at home wherever my friends and family happen to gather, share, and celebrate. It is getting to be the time for me to buy another house. I will get exactly the one with all the right specifications, but it wont be my home until my daughter and friends come over to visit, stay and sometimes even live for awhile. So that is my long-winded diatribe with ‘home.” A bit different than most, but it works perfectly…..